Data from the Radiation Belt Storm Probes Ion Composition Experiment (RBSPICE) on board each of the twin spacecraft orbiting Earth revealed that the highly energized population of electrons of the inner radiation belt is organized into very structured patterns that resemble slanted zebra stripes. Scientists had previously believed that increased solar wind activity was the primary force behind any structures in our planet’s radiation belts. These zebra stripes were shown to be visible even during low solar wind activity, which prompted a search for a new physical mechanism of their generation. That quest led to the surprising discovery that the stripes are caused by rotation of Earth. The findings are reported in the Mar. 20 issue of the journal Nature. The Radiation Belt Storm Probes Ion Composition Experiment (RBSPICE) is a time-of-flight versus energy spectrometer, the most prominent feature of which is the sensor known as the “puck” (because of its resemblance to a hockey puck). 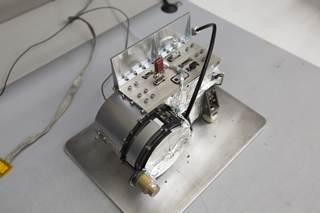 RBSPICE measures medium energy protons, electrons, and ions (H+, He+, and O+) as functions of energy and angle, and is capable of measuring the full range of expected ring current energies, intensities, and ion compositions from quiet conditions to extreme events, with a factor of ten margin against intensity saturation. 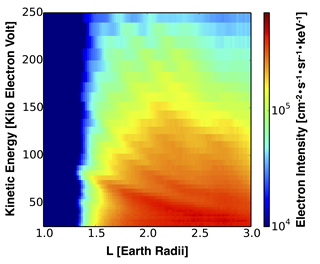 "Zebra stripes" in the inner radiation belt: An example of energetic electron spectra, measured on June 18, 2013 by NASA's twin Van Allen Probes in the inner radiation belt during quiet time during low solar activity. The striped, banded pattern is caused by the rotation of the Earth, previously thought to have no effect on the highly energetic particles of the radiation belt. This animation uses actual data gathered by the Van Allen Probes from within Earth’s radiation belts, showing the formation of a zebra stripe pattern. It is caused by a process that can be likened to the stretching and folding of a taffy-like fluid; in this case, the clouds of electrons that make up the radiation belts. The stretching and folding occurs as a result of Earth’s rotation with its tilted magnetic axis.